Reclining Dionysus sculpture on the East Pediment of the Parthenon, Athens. Greece. The Asian Art Museum (in San Francisco) recently had a joint exhibition with SFMOMA. The latter is under renovation, and so SFMOMA is “on the go”. As I work in the Civic Center area, I was able to visit this exhibition a few times at lunch with a number of colleagues there. “What’s “gorgeous” to you? There’s often a fine line between attraction and repulsion, but this summer at the Asian Art Museum, we’re drawing no lines at all. Among the exhibits were “Michael Jackson and Bubbles” by Jeff Koons, and the “infamous” “Fountain” by Marcel Duchamp. As I am also a member of SFMOMA, I have seen most of the exhibits at SFMOMA. But to see them in this context, standing side by side with another ancient art object, was not too often. I enjoyed this exhibition very much, and all my colleagues that I brought over concluded that they are indeed “Gorgeous”. The show ended last week. I like the show and the docent’s guided tour which was very helpful stimulating us to think and to see these art objects in different lights. 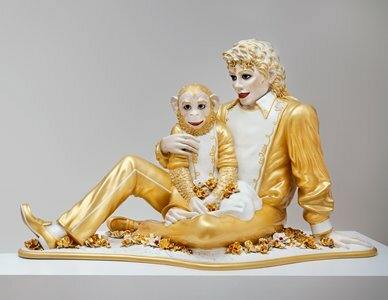 Among these exhibits, the sculpture “Michael Jackson and Bubbles” was one of the most favorite among the visitors . Many of my friends took pictures with the sculpture. At that time, I just glanced at it and took pictures for them, but never thought of anything more than the gold and white, the pop star and his chimpanzee. I did not bother to find out more about this piece, and just regarded it as one of those expensive arts because of the famous pop star and creative artist. Well, I was quite ignorant. Today, this sculpture was brought to my attention again because a fellow blogger Artdone wrote a post about Jeff Koons and an exhibition at the Whitney Museum. Out of curiosity, I looked up a few things from the internet and suddenly became “enlightened” by an academic article written in 2002 by Susan Cameron. I was so inspired by her writing that I suddenly realized that I saw “it” before. It was in Athens! Modern art in Athens? I must be crazy. Please hold on. Before we talk about this interesting article, let me find out a bit of the history and information about this sculpture. SFMOMA has an interactive site and a YouTube video. Check them out. I saw two of them : in SF MOMA and LACMA. Where is it in Athens? So I searched around but I couldn’t find it online. My conclusion is that it is not in any museum or public display. But I visited Athens before…an instinct told me to look up my pictures. Here it is ! I am so happy. 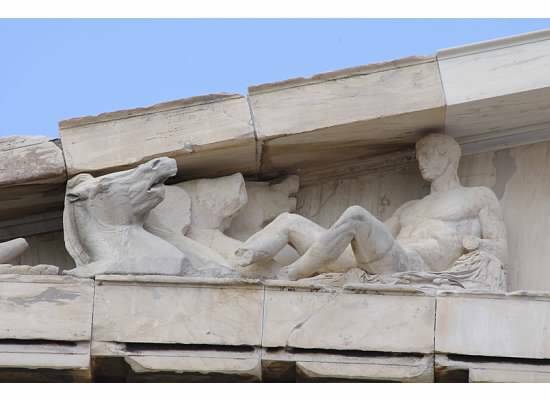 It was the “Reclining Dionysus“ sculpture on the East Pediment of the Parthenon, Athens. Greece, a picture I took when I visited Athens in 2011. How does this photo relate to this sculpture? Let us now come back to the article written by Susan Cameron, May 2002, SURJ, Stanford Undergraduate Research Journal. She noticed that curators only wrote useful information about the sculpture, but it does not mention the obvious iconography link to “Dionysus”. She thought that Koons crossed the traditions of ancient Greek cult statues at the Parthenon, with pop culture. Was that what Jeff Koons had in mind when he created this sculpture? Well, the viewer completes the art (Marcel Duchamp). What do you think?